There are many harmful germs like bacteria and virus which is present in dust particles. Apart from various health issues, if there is dust all around, it does not look good and hygienic. Dust is seriously bad for your health as well as for other household goods, appliances and decorative items. I realized this late, but thankfully found ways to deal with house dust much effectively. If you are tired of house dust and wondering if there are ways to keep your house dust free then here’s the post worth reading. Be it summer, spring, monsoon or winter, the dust does not check with weather before settling in your House. There are many sources by which the dust can find its home in your house. The dust and mites can be omnipresent following the consequences. Dust allergies, flu, stomach problems can be caused due dust and dirt. You must keep your home dust free for the sake of hygiene and better health of your family. Dust is made of fiber from clothing and paper, dead skin cells, pollen grains of plants, and polluted particles. When you inhale the polluted air, some of these particles may enter in your body and cause havoc. You may have severe dust allergies in the form of cough or sneezing and may have runny nose and headaches. That is why, it is essential to put every effort that helps you to keep dusts off your home. In order to get rid of all of these issues, you got to make your house dust free, and trust me, it’s not that difficult. Today in this post, we are going to discuss about everything worth knowing about a dust free house. Why is there dust in your home? If you do not dry clean the appliances and the furniture even for one day, then you will surely find a layer of dust the next day. Ever wondered, why there is so much of dust in the house? Dust particles are invisible to the normal eyes, but that does not mean the house is clean. If you observe carefully, you may find dust all around. The pollution of the outer world, the pollens, smoke from kitchen, dead skin cells, the hair and feather of pets, your hair, and all the minutest particles contribute to the formation of dust particles. You cannot prevent dust from entering your home, but you can prevent them from affecting you. You can certainly make your house dust free and that’s what matters. The more the number of objects, the higher is the chance of dust and dust mites. And if you have pets at home, then that may further add to the dust accumulation. So the best approach to keep your house dust free is to ensure that there is no clutter. If you are cleaning your home daily, keeping your doors and windows closed, using other gadgets like air purifiers and humidifiers, then you can keep your home free from dust, much effectively. The dust particles are negligible in weight, and they get mixed with the air you breathe in your home. 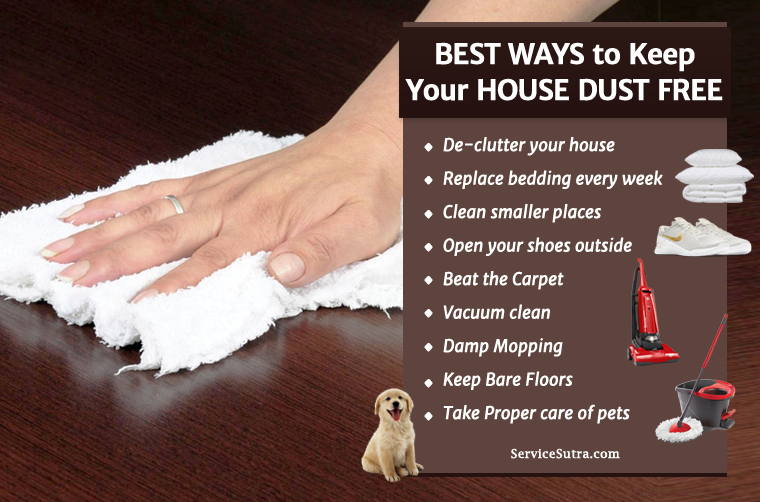 Here are some of the tricks I use to keep my house dust free, and I am sure you can use some of these tricks to make your home dust free too. The very first thing that you got to do is to make space and the best way to do that is to declutter. Get rid of anything that you have not used in past six months, be it an old shoe, or the speakers. If you have wardrobe full of clothes, but you use only handful of clothes, then it is better to get rid of those extra fabrics and free some space. Not just clothes, if you have some extra gadgets and other such items, then dust particles will get accumulated on those objects due to non-use. You can put those objects on sale, or simply pack and store it properly. When you de-clutter the space, it will certainly look much cleaner and organized. And it helps in daily dusting and cleaning as well. Getting rid of all sorts of extra stuff should be your priority. The bedding is another important place where maximum of the dust particles gather. You sleep here daily, your skin cells, hair particles, etc all gets mixed up and they fall on the bed sheets. The beddings, pillow covers, cushion covers etc must be dusted daily. If you sleep on the dust particles, then you will have risks of allergies and falling sick. If you want to make your house dust free, you can’t afford to miss changing the bed and pillow covers. The vacuum cleaners are really one of the best technological advances when it comes to cleaning your home or workplace. All you need to do is to swipe the cleaner on your carpets or floors, the device will suction up all the dust particles and dust mites. The dust will be gathered in a bag, and you have to empty the bag after one round of cleaning. Do not go on cleaning with the same bag and wait for the bag to get filled. Daily dusting of floor, carpets, sofa cover etc helps big time in keeping your sweet home dust free. Here you can use the traditional method of cleaning that your granny has used all these years. Hang the carpets or spread the carpets under the sun, then start beating it with a hard stick. You can see the clusters of dust particles. It is better to wear masks so that dust doesn’t get into your lungs, while you breathe. This is not something you have to do daily, but beating the carpets once or twice every quarter will do. The small and insignificant spaces that may get overlooked must be cleaned properly. The window blinds, window sills, hinges of doors and windows, window grills, the hinges of your gates, the appliances like fan and Laptop, the phone, the table tops, etc. There are many such small places in your home where the dust particles may get accumulated. If you wish to keep your house sparkling clean, then don’t ignore such smaller places, make sure to clean these everyday or at least every alternate day. In many Asian countries, including India, there is tradition to open the shoes outside before entering the home. If you are walking and entering your home wearing the shoes, then you are actually bringing all the germs of the roads in to the house. This is unhygienic and when ignored, it may cause serious illness, like diarrhea and dysentery. Open your shoes before entering your home and keep all the germs outside. You can have a separate shoe rack where you will keep your shoes after entering your home. Keep the shoe rack covered to prevent the dust from spreading. If you want to keep your home dust free, then the best way is damp mopping. Use a mop or a sweeper, damp it in water and then swipe it on the floor gently. Water will make the floors clean, the dust particles will be too heavy with water and thus can be cleaned easily with the mop. You can use some floor cleaners that are available in the market. Or, you can also mix few drops of vinegar in lukewarm water, and then clean the floors with it. Wall to wall carpets can be the source of all the dust in your home. The carpet can hold huge percentage of dust. It is advised that you can get rid of the carpets and instead use some rugs, where few parts of the floor will be covered with rugs. You can use some hard flooring like marbles, wood, vinyl for the décor. Otherwise, the floors can go bare. It is easier to have a dust free home when the floors are bare instead of the carpets. If you have pets, then you can clean your pets at frequent intervals. The hairs, the litters contribute to the dust present in your home. Clean them frequently, trim them get rid of the skin cells and thus you can have a clean home. Keep the litter boxes covered so that the dust and germs cannot invade your home. You can install a humidifier in your home to maintain the humidity of 40-50%, so that the dust particles remain static. To keep the dust at low levels, this is the best solution. If the air is too dry, then the dust will then move very easily from one place to another because of their light weight. If you use humidifier then the dust particles will be comparatively heavier and thus static in nature. It is better to install an air purifier in your home, especially if your city is high in pollution. You can install whole house units or single portable ones for each room. The air purifiers have fans in them which bring down all the dust particles and pollutants. The air purifier will collect all those dust particles in a bag like structure installed within them. Make it a point to empty the bag, just like you do in the case of vacuum cleaners. There are many clothes in your wardrobe which you do not wear frequently, like the suits and the lehengas, they may get dusty. For that, you can keep them in separate bags available in the markets. These bags are specially designed with chains, for your special clothes. Keep the wardrobe closed always. You can keep naphthalene balls in your wardrobe to prevent dust, moisture and also any other insects. You have glassware in your home, showcases with glass sliding doors, glass panes etc. The glassware gets dusty with time, but you can keep them clean. Rub the glassware with dry cotton cloth, and then apply some glass cleaner solution on the objects. Wipe it with another clean and fresh dry cotton cloth. Always use softer clothes to clean precious glassware to avoid any scratch or damage. This is a very tricky place as keyboards have negligible space between them. The keyboards can be cleaned with a slim paint brush. The soft feathers of the brush will be able to clean the keyboards properly. Do not use any water or any solution here; just dry clean the keyboards with paint brush. You can do it daily to stop the accumulation of heavy dust particles. Dust particles are dry, so you can remove them very easily. All you need is a dry fresh cotton cloth or a fiber cloth. Wipe the objects with it. Then spray some cleaning solutions, and wipe them again with another fresh cloth. This is the easiest way you can remove the dust particles. Wear masks while you are cleaning your home, as this will prevent you from inhaling the dust particles present in the air. When does it get dustier? Daytime is the hours when it is more prone to get dusty. Dry climate, scorching sun helps to make the dust particles light and they can get mixed with air easily. If possible, keep the doors and windows closed at noon to prevent the dust from entering your home. The drier is the weather; the higher is the chance of dust accumulation. This is the reason, why during the monsoon season, the dust in the house is comparatively less. Since there is plenty of moisture in the air, and the dust particles are heavy, it does not spread easily. If you are prone to dust allergies, then there are several home remedies you can use to deal with dust allergy. Remember to wear masks when you are cleaning or mopping. If required, replace the carpets and make it bare floor, because if the carpet is not maintained properly, it may accumulate dust. Mix pinch of salt and baking soda in a glass of lukewarm water. Use this nasal solution to clean any of the dust particles that may be present in the upper part of the respiratory tract. Wash your face and hands with soap every time you touch something that has dust on it. Drink peppermint tea, it has anti-inflammatory properties which will help you to fight the allergies. Inhale steam to clear the nasal passage. Have tablespoons of honey during allergy. If you have skin rashes, then you can dab honey on your rashes. But please note that it’s not a medical advice and may not work for everyone. If you have severe dust allergy, it’s better to visit a doctor and take proper medicine as required. In order to enjoy dust free environment at home, you will have to adapt some healthy habits and this will bring great change. With each small step, you can actually enjoy hygiene, prevent diseases and also allergies. You can’t stop dust and mites from entering your home or workplace, but you can certainly deal with it much easily and effective. We have already discussed some of the easiest ways to keep your house dust free. And hope, you will use some of these simple techniques and make your house free from dust. What else do you think one should do to deal with house dust?